These baby names were pulled from birth announcements at a hospital in Oregon since the start of the year, (January-April 2014). I picked out the ones that I liked or thought were interesting. Which of these do you like best? To complete our week of analyzing German baby naming traditions and names, I present to you the lovely name Lorelei. It actually comes from German mythology. According to legend, a beautiful seductress lived on a rock headland on the Rhine River. The rock itself is located near St. Goarshausen, Germany and is named the Lorelei even today. It is said that the maiden, or "water spirit", lures fishermen to their death with her haunting voice and beautiful song. 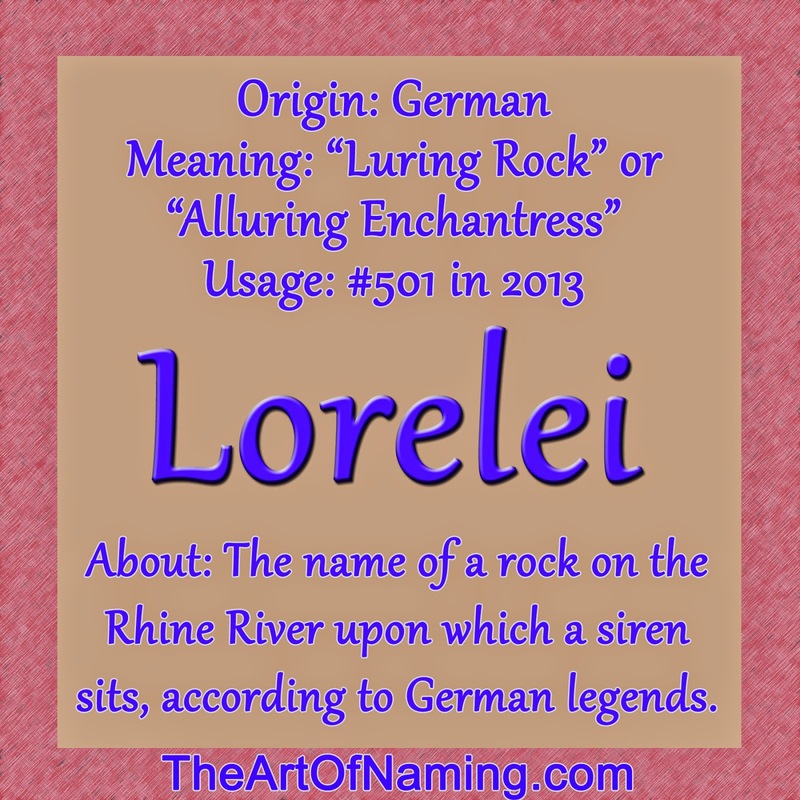 For this reason, Lorelei means "luring rock" or "alluring temptress/enchantress". It is sometimes spelled Loreley as well. The image of this deadly siren has been a part of the name Lorelei for ages. Some may view that with a negative connotation, and others may enjoy the mythic beauty of a singing mermaid seductress despite the fact that she caused many deaths. It is just a legend, after all, so it is up to you whether the association is an issue or not. Another strong association that has been around for a while is that of a gold digger in the film Gentlemen Prefer Blondes. She was portrayed by the late Marilyn Monroe. However, the most recent association around today comes straight from pop-culture. In fact, many people will think of these two Loreleis first upon hearing the name. On the TV show The Gilmore Girls (2000-2007), a young mom named Lorelei decided that her daughter would be a junior and named her Lorelei as well, but she went by Rory. They spelled it Lorelai but pronounced it the same: LORE-uh-lie. Their middle names were Victoria and Leigh. Other nicknames beyond Rory may include Lori, Lora, Lorel, Lore, and possibly even Lola, Lila or Lolly if you stretch it. Lorelei was first used as a baby name in the US in 1916. It gained more regularity in 1925 with a small spike in 1938 of 121 births. It did well in the 1950s and early 60s but tapered off again until it got a boost in 2002. It has been trending upward since then, climbing to a peak of 594 births in 2013 which ranks it at #501. Interestingly, the spelling Lorelai, used in Gilmore Girls, was not used at all until 2001, coinciding with the show. It has also climbed up the charts and had 336 births in 2013 for a ranking of #800. Which spelling do you like better? Lorelei or Lorelai? Perhaps something else? 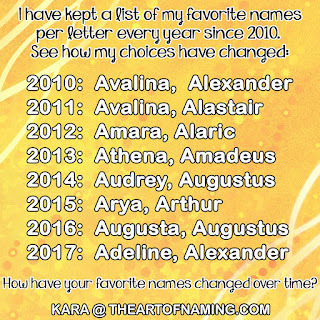 Here are some ideas for sibling and middle names if you're considering using this name for your child! What do you think of the name Lorelei. Does the German myth bother you? What middle name might you pair with Lorelei? Leave your thoughts in the comment section below or on Facebook! This month's World-Wide Wednesday features baby naming customs from Germany. 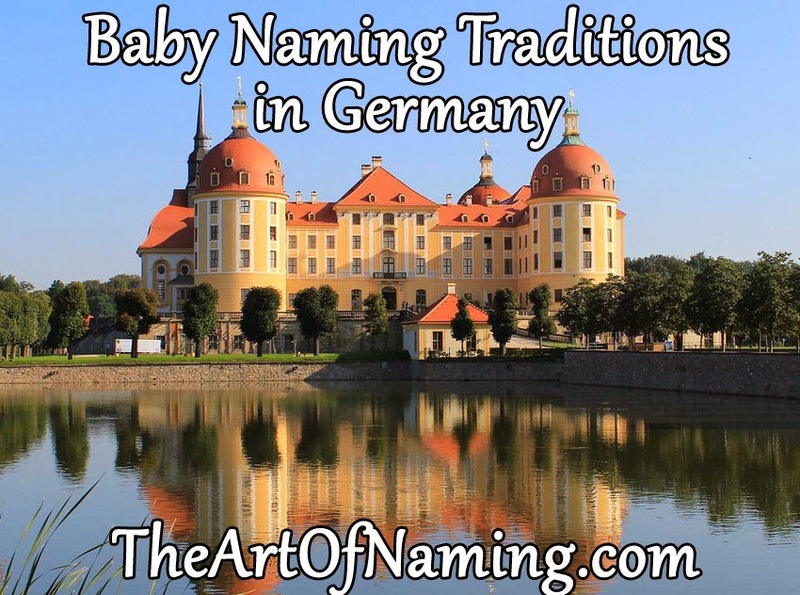 Prior to the late 19th century, Germany was a vast territory that saw major differences in the way baby names were given across the land and in different time periods. Traditionally, most boys in central and southern Germany in the 1700s were named Johann or Johannes. (Hans was big in the 1600s). Sometimes they would go by a middle name to differentiate between them. Similarly, girls tended to be named Maria or Anna. In the north and northeast, children in the mid-1800s received anywhere from three to five given names. This was a sign of nobility. The more names a person had, the more important they would appear. In records, ministers would often underline the preferred name, and sometimes marriage licenses would have the names in a slightly different order than what was on the birth record. They may have even been simplified or spelled differently. Surnames weren't regularly used until the 1500s. Up near Denmark in a place called Schelswig and a place called the duchy of Holstein, it was popular tradition to use patronymic names through to the 18th century. This means that most children were named for their fathers or grandfathers. For example, if a father was named Peter, his sons and daugthers would use the surname Petersen (and occasionally girls who were very near Denmark would follow those traditions and use Petersdatter as a surname instead). It wasn't until 1771 that this got to be rather confusing and a law was passed that required children to take a set surname, usually the same one their father had instead of basing a new one on his first name. In Ostfriesland, which is in the northwestern corner of modern Germany, people followed a patronymic pattern that was very similar to that of their Dutch neighbors to the west. Instead of adding -sen or -datter to their father's name, boys and girls would simply add an -s. The confusing part about this tradition is that back in Schleswig most wives would take their husband's name and add -s to it. Depending on where you lived, your name would indicate whether you were the wife of Peter (in Schleswig and Denmark) or the daughter of Peter (in Ostfriesland). As you can see, different areas had different customs that drew great influence from neighboring countries. Another example is that of the people of Westfalen which borders Hannover, Rheinland. Since medieval times, they had an entirely different naming method. Surnames were called Hofname or "farm-names". The family living on that particular farm would take that particular surname. If a daughter inherited the farm and married, her husband would change his name to that of her farm. His old name would be listed with his new surname with a phrase such as genannt, vulgo, modo, sive, or alias listed between them meaning he had one surname but was called by another. Today, there are still some faint remnants of these patronymic systems but they don't tend to form a child's official name. 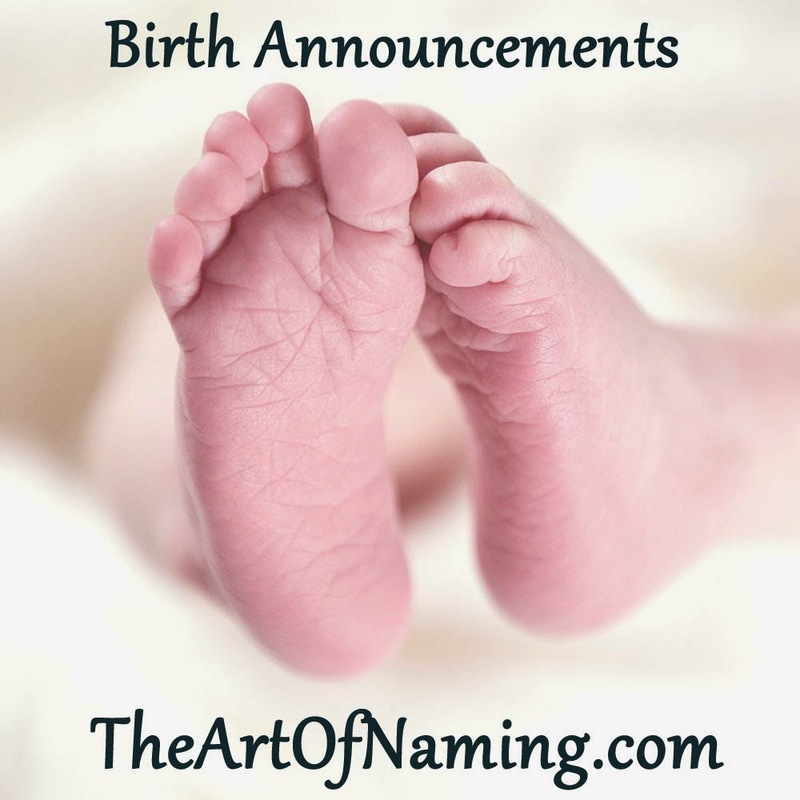 Names consist of one or several usually gender-specific given names and a set surname. Women traditionally adopt their husband's surname and hyphenate it with their own. If there were duplicate names in the pattern, they'd usually skip to the next name in the pattern. If a child were to die in infancy, their name would be reused for the next child of the same gender. They would be known as Heinrich, Wilhelm and Gustav. Girls would have a similar situation but most commonly with the first name Anna or Maria. This occurrence did not always happen though. It did depend on the family and when and where they lived. What do you think of the baby naming customs of Germany? Do you have any German relatives with names like these? Which traditionally German name is your favorite? Feel free to share your thoughts and experiences in the comment section below or on our Facebook page! The awesome baby name lovers on Instagram and Tumblr have spoken! When polled about which German name I should feature for my World-Wide Wednesday segment, Alaric was the clear winner for the boys! The girl name is coming on Friday! 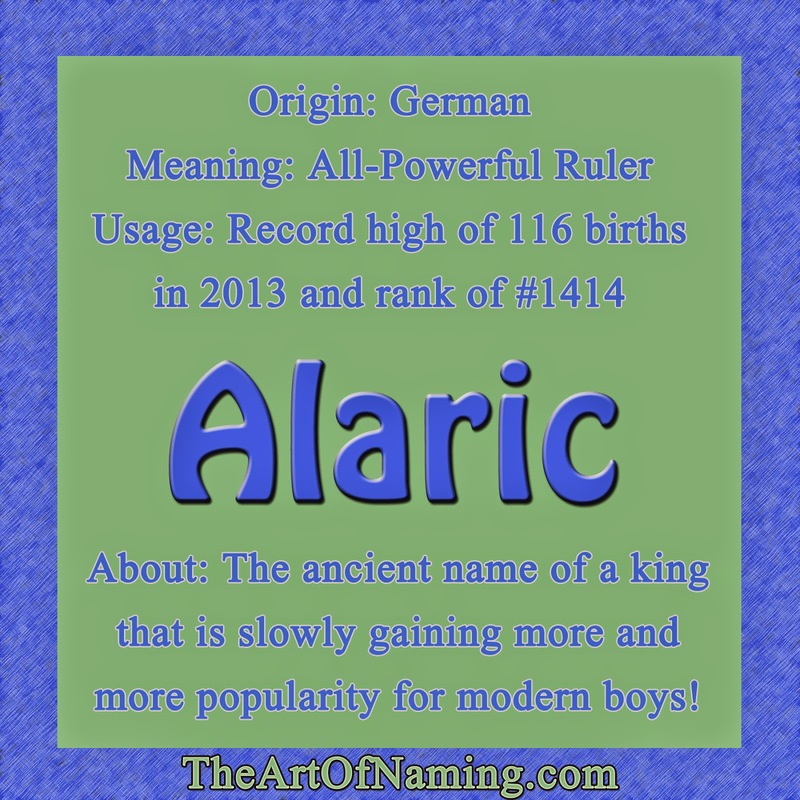 Alaric is an Ancient Germanic name meaning "Ruler of All" or "All-Powerful Ruler". It comes from the Gothic name Alareiks and is derived from the Germanic elements ala "all" and ric "ruler, power". In history, Alaric was the name of the king of the Visigoths who sacked Rome in the 5th century. Because of this king, the name has a very ancient and regal feel to it, but it still has the potential to be a cool, quirky and modern choice for a baby boy today. This name is still flying under the radar in terms of popularity. I've seen it discussed many times on forums but as far as actual usage goes, it is rare! It first appeared in the US in 1949 and it took another ten years to catch on regularly. Alaric is just now coming into its prime! It hasn't had much love until recently with 88 births in 2012 and a record-high 116 births in 2013 for a ranking of #1414. I think Alaric could potentially break into the Top 1000 in the next decade. It seems to be a growing favorite! Alaric is a bold and strong name on its own, but it also has the nickname possibilities of Al, Ric, Ricky, Lars, Alec, Alar and Aric. It is typically pronounced AL-er-ic, just like it looks, but this name is used on the TV show The Vampire Diaries and is pronounced as uh-LAR-ik. I definitely prefer the typical pronunciation. I tried not to only pair other German names with it, but it was a bit tricky to get decent flow. What do you think? Which names would you use? Ever since I began The Art of Naming, I've had a pretty firm stance against using popular names. My objective was to help parents find obscure and unusual names to use instead of going with the most common choices that everyone else is using. While I still completely love unique names, I have a big confession to make. As many of you may know, my husband and I are expecting a daughter in August. We have chosen three names for her, a first and two middles. The kicker is, despite all of my pro-unusual name posts, two of my chosen names are within the Top 50. [Cue the collective gasp]. We were originally planning on using a first name that ranked in the mid-200s but now we've bumped it to the middle name. We will be using one of the more popular names as her first name because it *feels right*. If any of you have had a child, I'm sure you can relate to the feeling of a name just being "the one". I realized it when I saw her little face in an ultrasound picture. You can't hate me too much for falling in love with a popular name, right? You still love me? All of this has got me thinking about popularity. How important is it? Really? I began obsessing over baby names when I was 17. I was more on the clueless side of things and only looked at the name based on how it sounded. Over time I began to appreciate meanings and history and eventually popularity. Today I feel as though I've been so darn picky about everything in recent years that I've finally had to give in to what names I really love and relax on the technicalities behind them. The names I've chosen are more popular than I thought I would have ever chosen but they're also full of great meanings and some family honor. This triumphs over popularity for me. I have done my research and know how popular my choices are. I'm to the point where it finally doesn't bother me. However, a year ago, I would have never actually gone through with using a Top 50 name as the first name just on principle alone. Perhaps I'm experiencing character development? That, or I've taken comfort in the fact that popular names of today just aren't as popular as they once were in the past. Take for example the most popular girl's name ever: Mary. She peaked in 1921 with (are you ready for this?) 73,983 births. Can you wrap your brain around that figure for a moment? And then remember that she lingered around those types of figures for years! She was the #1 or #2 name every year from 1880-1965 and still remained in the Top 50 until 2001. Today she's fallen to #121 but still received over 2,600 births for the year. If that isn't popular, nothing is. What do these stats tell us? The true popularity of a name is deceiving. There are people every year who now combine all of the various spellings together to find out what the "True Top Names" are. And I was only comparing the #1 names in the above image. 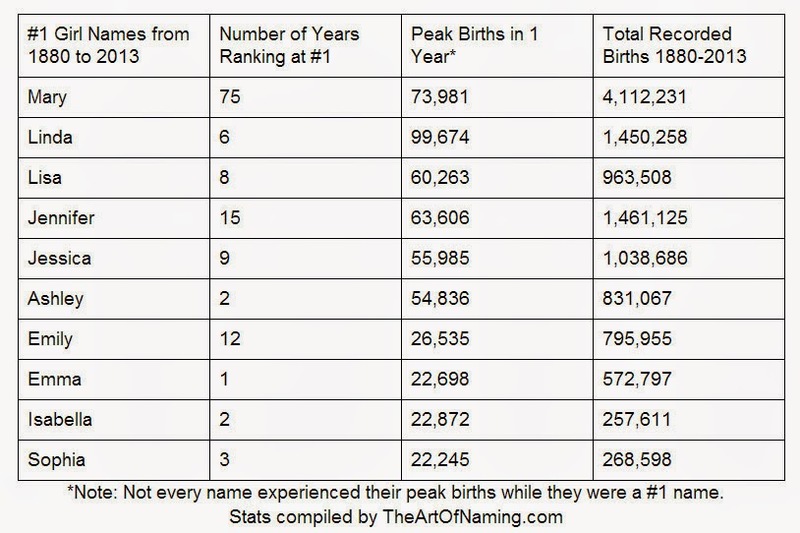 When you climb down the chart a bit and realize that the names in the #30-#40 range (where my daughter's name sits) only get about 5,000-6,000 births per year, it suddenly doesn't seem that bad. Think about how huge this country is and how many babies are born every year. Sure, she may know a couple other girls in her school with the name, but I'm currently not worried about it. If you have a very common last name and give your child a very common first name, chances are they'll run into an issue at some point in their life with having the same exact name as someone else they are near, so popularity may be a priority for you and that's great! Choose something odd! However, many parents worry about their child being 1 of 4 in a classroom with the same name. If you're one of those, I'd suggest searching for something more obscure if it really bothers you. So what do you think? Does popularity really matter? Does your child have a common name? How has it worked for them? Was your name popular in school? How did you deal? Let me know in the comments below or on Facebook! For your challenge today, you will be naming three hypothetical siblings! This past Tuesday, we saw a list of baby names stolen by big car companies and we learned all about the name Ford a couple days ago. 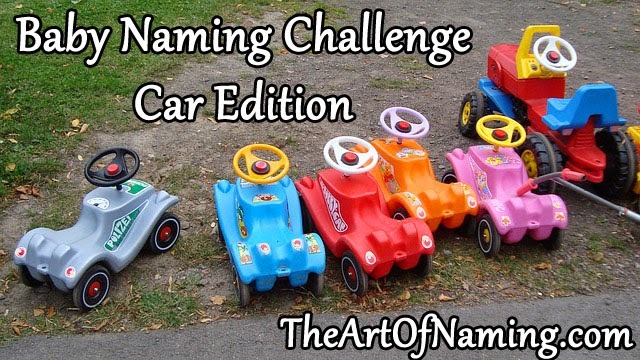 In honor of "car week," I want you to think about your vehicle history when choosing the names for the challenge. If that sounds crazy, just bear with me a moment. Model = The "brand" of the car. Sometimes this is just a letter or number, or a word or name. If the make of your first car starts with A-L, you're having a boy! If it starts with M-Z it's a girl! 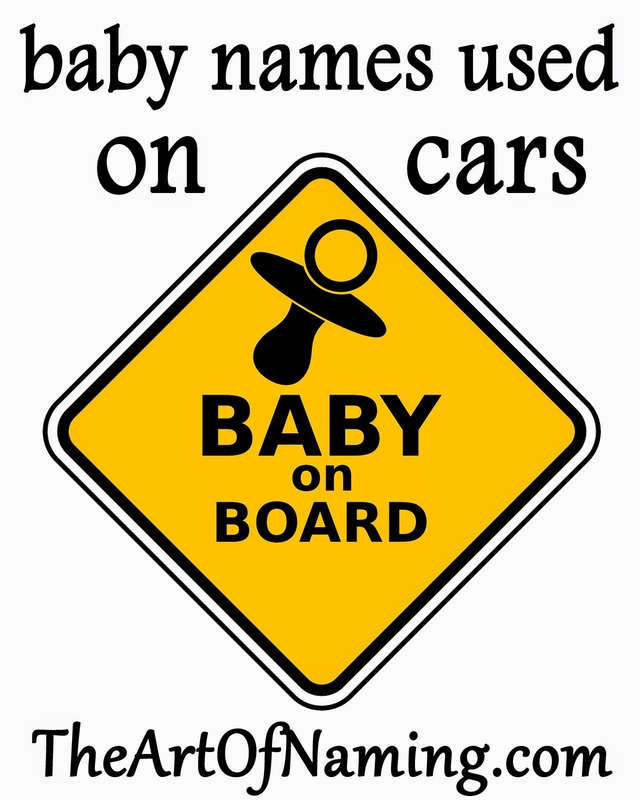 Take the first letter of the make of your car and use it for the first name of the baby. If the model of your car is a number/letter sequence, choose a vowel for the middle name. If the model is a name or a word, choose from B, D, F, K, T and W for the middle name. If your current car is blue, green, red or black, you're having a boy! If your current car is any other color, it is a girl! If your current car is 2-door, the first name starts with either A, L, O, P or R. If your car is a 4-door, the first name starts with C, E, J, M or S.
If your car has tinted windows, the middle name must be 2 syllables long. If not, go with a 4 syllable name. If you currently have a big vehicle, (truck, SUV, crossover or van) it is a boy. If it is a smaller vehicle (coupe, wagon, sedan, luxury, hybrid) then you're having a girl! If you drive an automatic, choose a first name that begins with a consonant. If you drive a manual, choose a first name that begins with a vowel. If your current car was made in 2005 or earlier, the middle name is 1 syllable long. If your car is a 2006 or newer, the middle name is 3 syllables long. Since this is "car week", we'll look at the boy name Ford. The Ford Motor Company has been around since 1903 and was founded by Henry Ford. 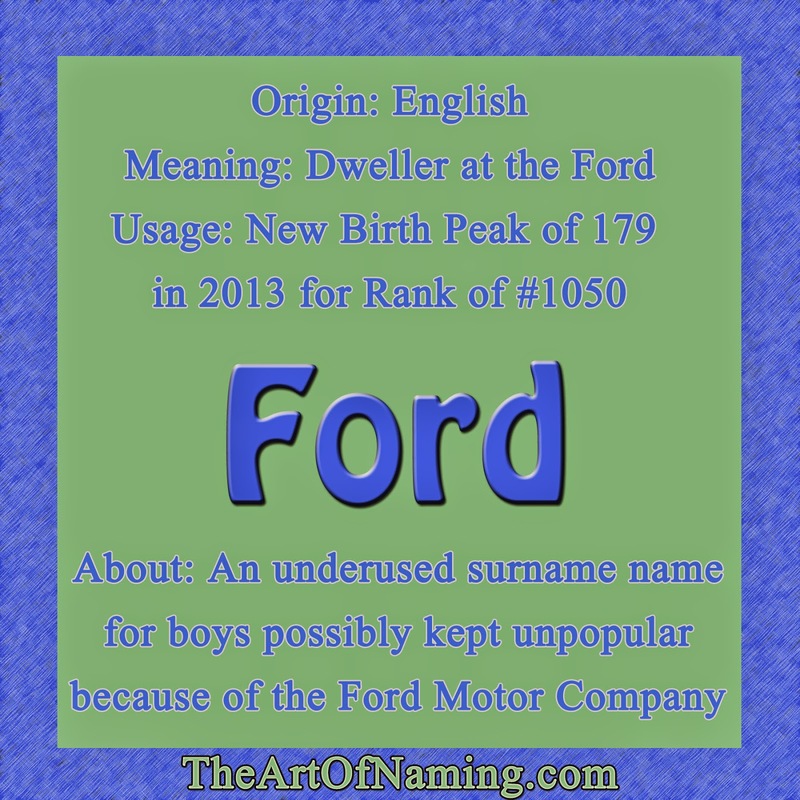 Clearly, the name comes from a surname but it was originally derived from a place name meaning "ford" in Old English. Nameberry says that it means "dweller at the ford". A ford is defined as "a shallow place in a river or stream allowing one to walk or drive across." That makes Ford a nature place name and a surname. Famous namesakes include the aforementioned Henry Ford, former U.S. President Gerald Ford, popular actor Harrison Ford, writer Ford Madox Ford, Pre-Raphaelite painter Ford Madox Brown and sportswriter Ford Frick. Actor Owen Wilson named his baby boy Robert Ford. In pop-culture, there's James "Sawyer" Ford from the TV show Lost, and Nathan Ford on the TV show Leverage. There's a character in The Hitchhiker's Guide to the Galaxy named Ford Prefect. This name seems to be used most often as a surname as opposed to a first name. 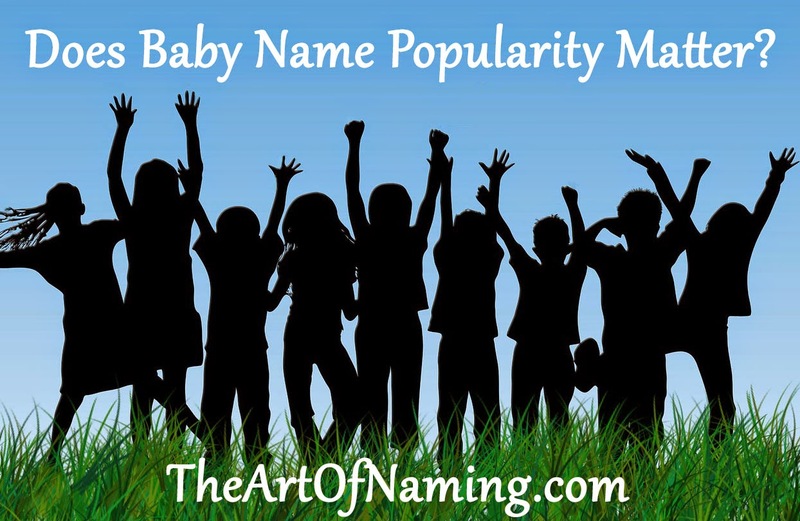 In fact, the history of popularity for this name contains very small numbers. The question is, are parents ignoring this name because of the motor company? There are plenty of surnames that have had popularity for boys over the years. Nameberry believes that "the long association to the Ford Motor Company doesn't stand in the way of this being a strong, independent, single-syllable name." Perhaps Ford just hasn't caught on yet. It has been given to boys since 1880 but only in handfuls. 1915 was a good year for Ford with 133 births and a ranking of #483. 1923 was also good with 115 births. Since then, the name has hung around in the 30-50 births a year range until it dropped even more in the 70s. It slightly increased again around 2000 and by 2013, the name Ford received 179 births for a ranking of #1050. It has now surpassed its original early peaks and could be poised to finally land within the Top 1000 again for the first time since 1951. What would you pair with Ford? What do you think of it as a baby name? Let me know your thoughts in the comment section below or on Facebook! Here is a list of names (and potential name ideas) that have been used by automakers and car companies. Are there any that you would love to use as a name but feel as if it is too closely associated with the car? I think Ford and Lexus are cool but they are very obvious. Have any of these been ruined for you or would you still use them anyway? There sure are a lot of little Bentleys being born lately! Whether you are inspired by one of these names or they make you think twice about your favorite, what do you think of the list? My favorites are Apollo, Aurora, Cadenca, Carina, Cavalier, Cressida, Elise, Jimny, Lumina, Maxima, Milan, Sable, Sephia, and Verona. What about you?